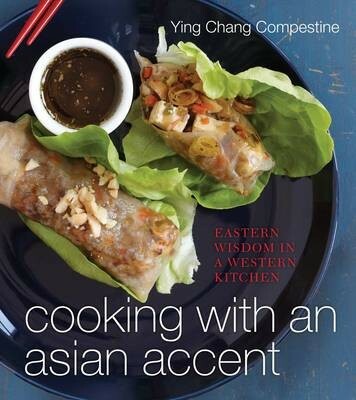 In "Cooking with an Asian Accent, "award-winning author""Ying Compestine, a nationally renowned authority on Asian culture and cuisine, reveals how to make delicious home-cooked meals that nourish the senses and the soul using accessible ingredients, simple preparations, and thrilling flavors." Cooking with an Asian Accent" is not another traditional Asian or "quick-meals" cookbook. It offers a new cuisine created through Ying's East-Meets-West journey, a style of contemporary cooking that brings three essential principles of Asian cuisine into the Western kitchen: food that satisfies the senses, harmonizes the body's Yin-Yang balance, and acts as medicine. Melding Eastern philosophy with Western-style efficiency, Ying's recipes offer a balanced approach to cooking everything from quick and healthy soups, salads, and stir-fries to sauces, condiments, and desserts. Accompanied by beautiful full-color photography and inspirational personal stories, this accessible, engaging book is ideal for anyone who aspires to home cooking that is simple, delicious, and revitalizing.